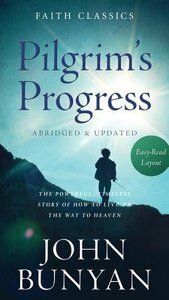 The classic allegory of John Bunyan—The Pilgrim’s Progress—has now been abridged and updated for today’s reader. Written in the 1600s, this timeless story still speaks to readers, realistically describing the joys and trials of anticipating heaven while living the Christian life on this earth. About "Pilgrim's Progress (Faith Classics Series)"
John Bunyan (1628-1688) was born in Elstow, England, and his life was spared twice in his early years, something he believed God had done for a special purpose. In November 1660, when Bunyan arrived to preach in the little town of Lower Samsell, he was informed that a warrant had been issued for his arrest. Unwilling to denounce his Christian faith and his calling to the ministry, he was imprisoned for twelve years. Among the many writings he published during his imprisonment are The Holy City; Grace Abounding to the Chief of Sinners; and the most famous, The Pilgrims Progress. After his release, he became the pastor of a church in Bedord, England and continued to write and publish stirring works that have endured through time. Among these classics are The Holy War; Bunyan's Visions of Heaven and Hell and Journey to Hell: The Life and Death of Mr. Badman.